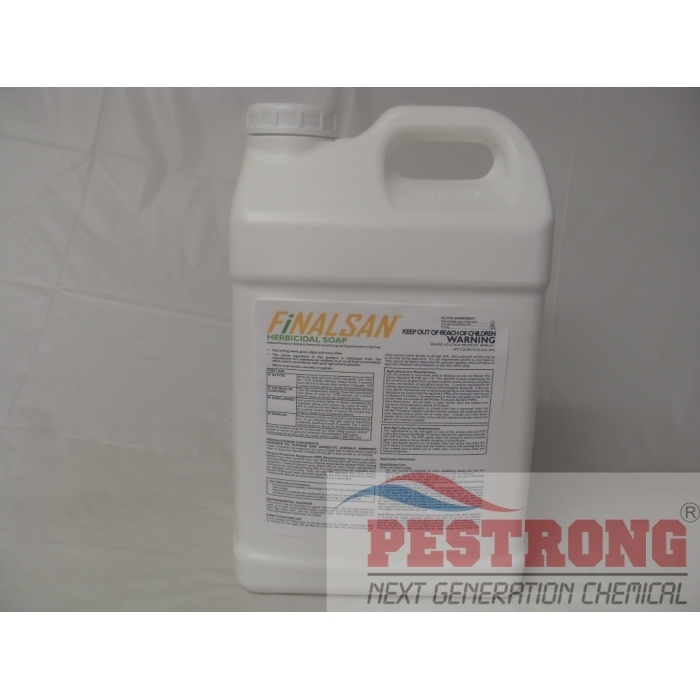 Where to Buy Finalsan Herbicidal Soap, Finalsan Weed, Grass, Algae and Moss Killer - 2.5 Gallon - $119.95 for Sale with Fast Free Shipping! Finalsan Herbicidal Soap is a non-selective fast-acting weed, grass, algae, lichen, and moss killer that controls and suppresses many common annual, biennial, and perennial weeds that grow around field-grown vegetables and fruits, trees and shrubs, and on roofs, decks, patios, walks, bricks, and cement. Finalsan Herbicidal Soap can be used any time during the year, even in cool weather, and leaves no harmful residue in the soil. Finalsan Herbicidal Soap use a specially formulated, non-staining, ammoniated soap of fatty acids. For the control of moss and algae, apply the mixed solution at 8.3-25 gallons/1000 ft2. (6.4 oz per 1 gallon of water, 5% solution) Spray weed thoroughly, using a coarse nozzle setting to reduce drift. Thorough coverage is extremely important. For spot treatment of individual weeds, apply the mixed solution to the center of plant to the point of runoff. Plant damage will be visible from a few hours to 2 days after spraying. Repeat treatment every 2 to 3 weeks to control new weeds growing from seed and re-growth from bi-annual and perennial weeds. Avoid spraying desirable plants. Thoroughly wash equipment after use. It's getting warmer these days and I'm starting to see some mosquitoes and I bought some of these alpine dusts remember how good it worked summer, and it worked just as well, keep up the good work.